Who hasn't noticed the yearly parade of new models whether computers and cars or motor homes and coaches released each year? They all have this-year's newest comforts, all the new bells and new whistles added. Yet, when the very next year models come out, there are more bells and whistles. Yet, those little touches of luxury are integrated into the same given dimensions . While these additions create restlessness for upgrades or trade-in's, when the restless urge for an upgrade comes, think about remodeling instead of trading, and let RV Outfitters get you ahead of the curve. To acquire the comfortable and luxurious changes of the year's new models, one trip to RV Outfitters after a visit to the dealerships will provide you with the experts who can bring those dreams features translate into your coach. There you will be welcomed to create this year's and several more custom advances into your coach or motor home. RV Outfitters is the most economical way to get a truly custom upgrade that will add features you've looked at in newer models or need to make the space work better and fit the natural changes that a couple of years can bring. It can happen without couples being aware of how to make adjustments without drastic changes. When asked why he and his wife decided to sell their rig, an ex-full-time RVer found it hard to put into words why they gave it up. When I asked his wife, she quickly gave me a laundry list of daily differences in the ease of living in their small house. They hadn't tired of the adventure of travel; they were tired of making do with a seemingly wonderful interior that didn't offer any place for him to do his wood carving or for her to quilt. Then, there were the complaints about the flooring being difficult to keep up, the lack of sufficient counter space and cabinet organizers. And, when they had bought their coach, stone counters weren't available nor were tile or wood floors available for the floors. She had dishwasher drawers in her new kitchen but not in the RV. She had been tired of the colors, the window treatments, and wall treatments; he needed bookshelves. I guess we all like to change and to update our surroundings. Tales of bad experiences in remodeling RVs get circulated between travelers. Not so with the customers of RV Outfitters. Customers cannot find enough complimentary words to praise the legendary service offered. Often, those who remodel will lack the knowledge of how coaches are built. From the ground up, Jim and Gary at RV Outfitters utilize their expertise that came from years of experience at the factory where coaches and motor homes were manufactured. They use this expertise to expand the available interior space, utilize the "lost” spaces and create better flow within the coach. 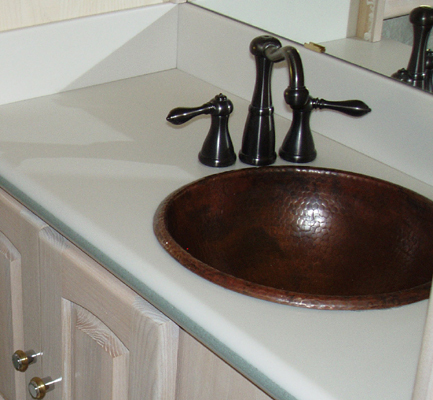 Want a new bathroom vanity, a new look that modernizes with clean lines? Look to remodeling for the affordable way to add one by one the upgrades that make a space become home. Today, there is no more affordable luxury than that of remodeling an existing or a newly acquired used motor home or coach to turn it into the dream-mobile. One need only to consult with the experts to get a fixed estimate and a time line that RV Outfitters will deliver as promised. Ask one of their customers! We know our little project was nothing like the larger remodels that you do but you treated us as though we were your top customer. You kept us informed on progress and made extra effort to find a way to make everything work. Our overall experience working with you is an A+ and I wanted you to know that!!! 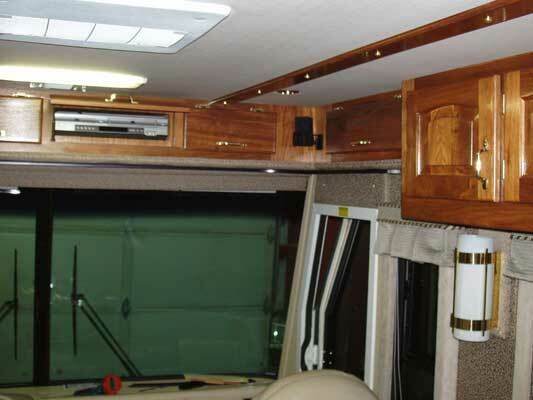 We will highly recommend you to anyone wanting to upgrade their RV interior.